The Dual Cam Sway Control has three main components. The cams, brackets and the chains. On the High Performance unit there are brackets that mount to the trailer frame for easy hook up and less chance for interference with other equipment on the front of the trailer. The Friction Sway Control has three main components. The friction assembly, mounting bracket and the ball. 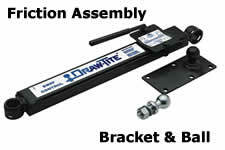 We offer several models of Friction Sway Controls to fit any price range. Data generated in 0.002338 (s) from 6 queries.